We are into our eleventeenth consecutive day of fog. Actually, it’s probably not that many, but it seems like it. As you can see from the photo, whatever lurks across the street from my house has been completely obliterated by the haze. A giant beanstalk could have been growing there all this time and we’d never know. 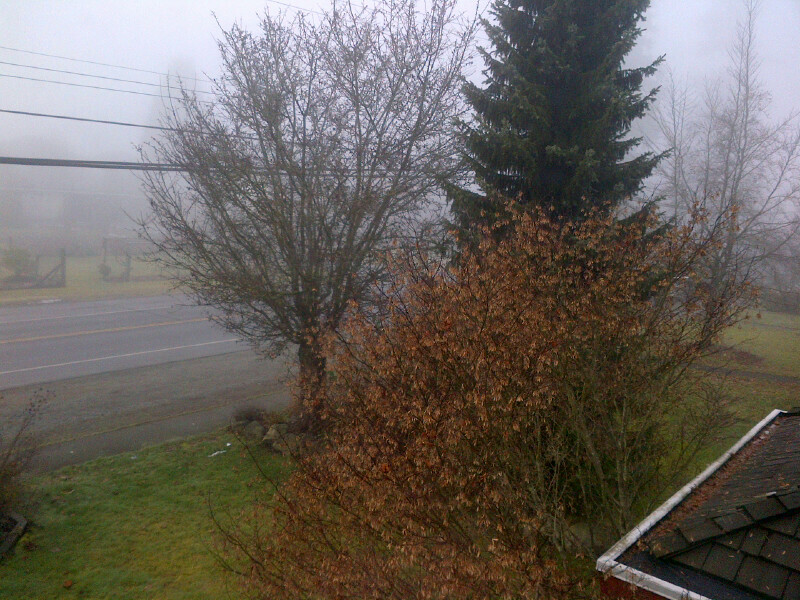 Have you ever noticed how fog seems to wrap around you and muffle your senses? Your balance is off. You aren’t sure where the sounds are coming from and you can’t see more than three feet in front of you. You feel like your locked into this mystical place where anything can happen. This is where your imagination can run wild. Maybe a little too wild. You’ve got a lot going on. You can’t seem to get ahead of the game when it comes to everything that’s on your plate. There are never enough hours in the day. You feel like your balance is off and you don’t know how to get it back. Your imagination runs wild. Everything becomes a very big deal. You don’t even realize that your perspective is skewed. Seeing through the fog is simple, however, when we take a deep breath and turn it all over to God. Really, it’s that easy. The hard part is letting it go. And not taking it back. Let God do what He does best. Be God. AMEN. GREAT POST. WE DO SOMETIMES TRY TO OUT “god” GOD. BUT IT S BEST THAT WE DO LET GO AND “Let God do what He does best. Be God.